Cooking a steak on a George Foreman indoor grill couldn't be easier, and is ideal for apartment dwellers and others that don't want to break out the traditional grill. It may not have the same smoky flavor, but the Foreman's signature grill plates will create a distinctive char on your steak. In addition, its slanted position helps remove unwanted fat from the steak, which is ideal for those closely watching their calorie intake. You can grill any type of steak cut you prefer, but the amount you can cook at a time depends on the specific size of your Foreman grill. Choose a lean steak cut to reduce your fat intake, such as a sirloin tip steak or a top round steak. Spray the plates of the Foreman grill with nonstick cooking spray and turn it on to preheat for five minutes. Trim the steak of any excess fat, and season it to your liking with sea salt, pepper and other seasonings, such as minced garlic and dried herbs. You can also brush the steak with an olive oil-based marinade as well. Read more: Is Grilled Food Healthy? Place the steak on the bottom plate of the Foreman grill and close the lid. Let the steak cook for seven to nine minutes, until it's well-seared on the outside and has reached an internal temperature of at least 145 degrees Fahrenheit, giving you a medium temperature steak. Serve hot. 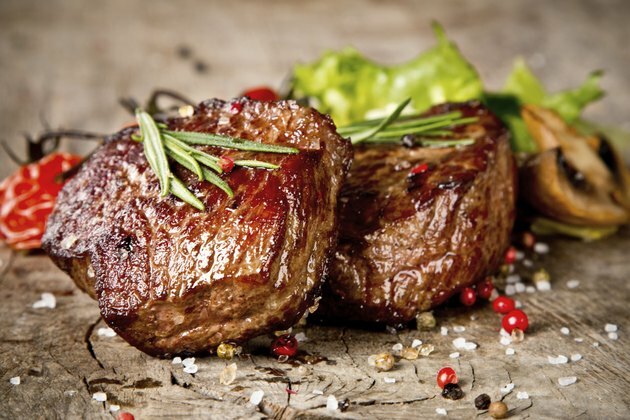 Read more: How Many Carbs & Calories Are in Steak? While cooking your steak to 145 degrees will give you a medium temperature steak, reducing the cooking time by a couple of minutes will give you a rare or medium-rare steak if you prefer, although not recommended by FoodSafety.gov. Consuming meat that is not fully cooked could lead to a food-borne illness.